But what are they really saying? They’re saying that they haven’t attached meaning to what a shift to Agile will look like. In the change world, we like to call these people ‘resisters‘. But I don’t believe in that. I believe people behave this way when they can visualize what the future might look like. Leap of Faith: People here are your innovators. They are the people who are going to actively promote the change and be more than happy to try out what you’re asking them to do. They don’t need motivation. They’ll try, experiment, fail and keep trying. These are the people who will become your change champions or part of your change agent network. Possibilities: People here are your early adopters or early majority. They might need to see how to participate in the change. They’ll get inspired by your innovators and they’ll also be a natural friction point for the change by being vocal with their questions. The difference is, their curiosity will be about exploring possibilities, not questioning why the change is happening. Norms: People here struggling with envisioning the future. Unfortunately change teams generally spend their energy focusing on this group and label them as resisters or laggards. These people will say things like what I wrote at the beginning of this post. Listen to them. Then leave them alone. They will come along once they see innovators and early adopters having success with the change. They need to see their own tribe doing this, they don’t need to be lectured by the consultant/coach/internal change team member. This is where organizational debt lies. Debt from a focus on hierarchy and process, debt from ignoring the happiness of people and debt from inward focus versus customer focus. Innovators: These people are problem solvers. They’re fed up with the status quo, positive, upbeat and are not afraid to try new things. They’ve been ‘reprimanded’ for ‘going rogue’ before, but they don’t care. They’ll do the right thing for the organization and the people. They’ll lead regardless of where they sit in the org chart. These people may only need to see a new practice, like ATDD or continuous delivery, and then they’ll go try it. Early Majority: These people are realists. They’re not afraid to try something new, but they will be more cautious and consider the impact to the organization. They may need to see how to participate by going to a training session. They might be aware of a new practice, but they’ll need someone to pair with in order to try it out. Late Majority: These people will be fence-sitters. They’ll wait until someone else gets the arrow in the back first! They need to see success before they can make sense of the change. As a change agent, your job is to attach these people to the early majority people. They need to see people in their tribe doing this. 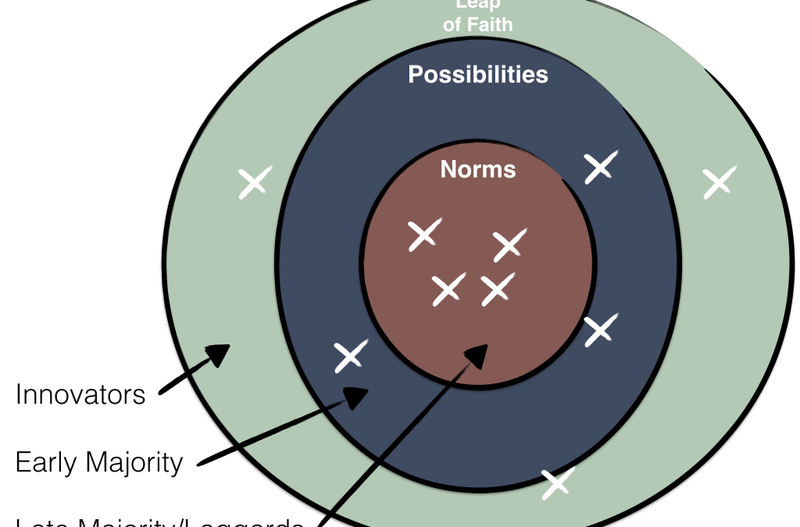 These people, when being presented with new practices, will immediately visualize how this practice could be hammered into the existing norms and typically they’ll jump to assumptions for why it won’t work. Generally speaking, more people need to live in the Leap of Faith or realm of Possibilities otherwise there won’t be enough momentum to keep the change going. The hard part is every person in the organization will be living in different mindsets. Within those mindsets, each person will be experiencing the change at different rates and intensities. Just because someone is an innovator, it doesn’t mean they can’t evolve into laggards if the change doesn’t work or they don’t feel supported. 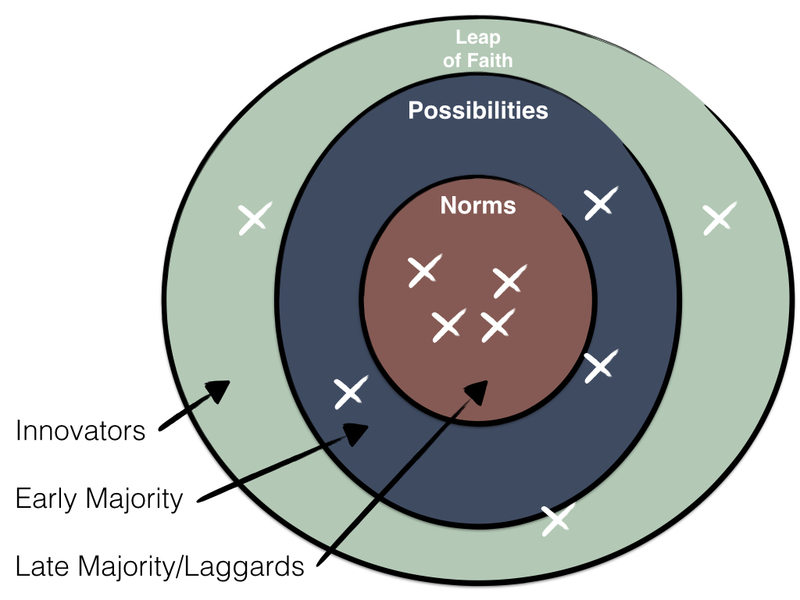 Given the model above, if key influencers live in the Norms, the change isn’t likely to work. That could be key managers or executives who aren’t actively supporting Agile. 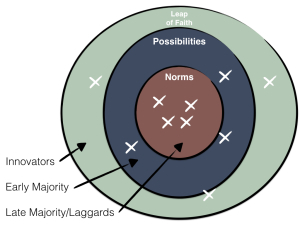 Even though many people may be living in the Leap of Faith or realm of Possibilities, one key influencer can kill the change by not supporting it. I’ve seem whole teams motivated to try Agile but had the whole effort squashed by a pushy project manager backed by their boss. I’ve seen entire departments, including management, fall back into old behave because of one executive who doesn’t get it. I’ve seen entire organizations fall back on the old way when a C-level isn’t motivated to fundamentally change the structure of the organization to support Agile. Like I mentioned in a previous post, people who live in the Leap of Faith or Realm of Possibilities leave the organization first when they don’t feel supported. This holds true to any industry or type of work. It doesn’t matter if your work is software, designing print material, managing people, managing training courses or what have you. Focused effort and shortening feedback loops in order to get feedback from customers is the step in the right direction to become an agile organization. what would it look like if we stopped working on 30% of our projects? if we created cross-functional teams, what would be affected? The problem I see is that so many organizations get distracted by thinking about Agile and lose sight of the 2 simple benefits of focus and feedback. As a change agent, when faced with the “we’re different” dilemma, steer people away from focusing on Agile and steer them towards focusing on focus and feedback. Let the innovators do your bidding and ignore the laggards…well, after you’ve listened to them complain of course. Think of implementing Agile as creating a movement. You’re going to be able to create a movement by inspiring people and while it might take a long time, people will be happier when they’ve attached emotion and meaning to how Agile can improve their lives. I like to think of organizational debt as the inertia that must be overcome to fundamentally change the norms in an organization. An example, in the context of moving to Agile, would be the annual planning and budgeting free for all. Let’s say an organization does their annual planning in October and then in January of the next year they decide to go Agile. There is a ton more, but it’s not always about the people, it’s about the system of norms that have been created over years…and sometimes decades.